Or click here to find the Check Center store nearest you. With 7 locations around San Diego County, and another 10 in Berkley, Oakland, and throughout the rest of greater San Francisco, Check Center has developed a reputation for being the go-to lender for South and North Californians alike. Call us toll-free 1-888-593-5626 with any questions. Check Center is licensed by the California Department of Business Oversight (DBO) under the California Deferred Deposit Transaction Law. 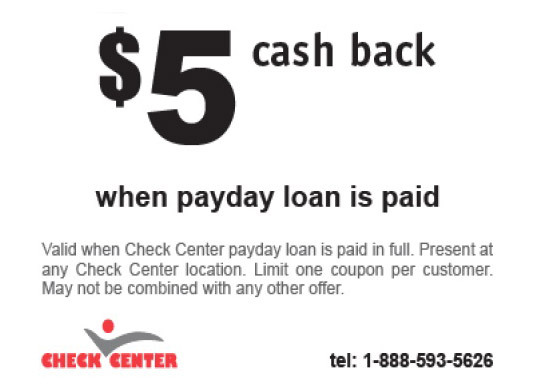 Check Center complies with all DBO requirements and all other relevant regulations related to payday loans. The DBO toll-free number is 1-866-ASK-CORP (1-866-275-2677). Check Center follows the California Financial Service Providers best practices for payday lending. Late or non-payment of a loan will not impact customer credit ratings. Check Center does not report customer payment history to credit bureaus. Late or non-payment of a payday loan results in a $15 late fee. Check Center accepts reasonable repayment arrangements. If a payday loan is not paid in accordance with its terms, we do not place the loan with a third party nor do we sell any loan to a third-party collection agency or other company that acquires and/or collects delinquent consumer debt. Terms, fees and APR differ based on the loan for which you qualify. For payday loans, use the sample loan calculator here to review terms, APR and fees. The DBO sets payday loan fee requirements. As a licensed payday lender in California, Check Center complies with all DBO requirements related to payday loan fees. Our payday loan fees as mandated by the DBO, including the fees expressed as APR, are available in chart form by clicking here.